Imagine waking up in the morning without worrying about touching the cold floor with your bare feet. That’s what radiant floor heating can do for you. 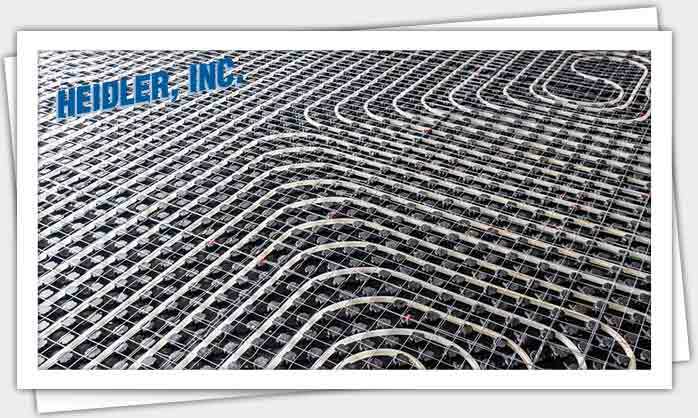 Call Heidler, Inc. to work with your Annapolis radiant floor heating experts. Schedule an immediate appointment by calling (410) 268-7191. Upfront pricing guaranteed. Want to save on your next service? Click here to view our current specials and discounts. Looking for a cost-effective and efficient way to keep your home warm this winter? Consider installing a radiant floor heating system. Floor-based heating systems that are designed to radiate heat upwards are often more efficient than fixed or standing radiators; they also save more energy overall than many central heating systems. Customers who have had this system installed in their home rave about the ease of controlling their indoor temperature. Want to see what else your neighbors are saying? Click here to read our latest customer reviews. Radiant floor heating systems feature hollow tubes that carry hot water beneath flooring. The system is designed to utilize thermal energy that heats the floors, as well as any other nearby objects, providing even and efficient heating to rooms, small areas, or even your entire home. Such systems often do little to raise air temperatures directly, but they are able to create a more comfortable environment by preventing the surfaces you come in contact with from stealing your body heat. Radiant heating systems, especially when used along with other heating devices and climate control equipment, can do much to ensure a warmer and more comfortable interior environment. A warmer floor surface reduces the need to use other heating systems that are not as efficient. Radiant floor heating helps lower the cost of your monthly electric and utility bills. We provide professional installations and ensure your radiant floor heating system is an asset in your efforts to maintain a warmer and more comfortable home during the winter. Radiant heating systems can be as much as 30 percent more efficient than conventional forced-air systems. The overall savings you experience will depend on how well-insulated your property is. A floor-based radiant heating system is the perfect addition to any home renovation efforts or projects that are designed to reduce utility costs as much as possible. Whether your current heating system is unable to meet your needs or you are looking to add a radiant heating system into a floor replacement or home renovation project, our professional installation services offer a simple way to incorporate the system that will best fit your needs. One of our experienced technicians will inspect your current heating system and assess the needs of your household. We will then guide you in selecting the systems and equipment that will provide the greatest value. Working with us to install your new heating system offers a convenient way to keep your home warm and lower your household heating expenses. If you are interested in doing all you can to create a more cost-effective and environmentally sustainable household, look no further than radiant floor heating systems. Call us today at (410) 268-7191 and be on your way to enjoying a more efficient climate control system in your home.